We are continuing birthday celebrations here at The Love Nerds with a fabulous Birthday Pool Party from One Tipsy Chick! I don’t know about you, but I have been dreaming about summer! Hanging by the pool, lounging in the sun, taking a walk on the beach, playing lawn games, BBQs – I can’t wait to have warm weather back! With an early March birthday, I was never able to have a birthday pool party. It was usually a sleepover at home in the basement for me. That didn’t stop me from dreaming about it every year though. Heck, I STILL do! 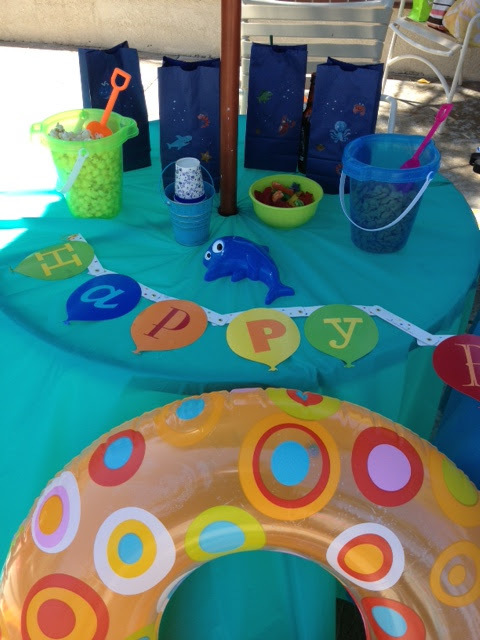 I would have LOVED to have a birthday pool party like my friend One Tipsy Chick organized for her daughter last summer! The best part for you? She was able to throw it all together in about a week. She’s busy … you’re busy… And she proves that you can throw a fabulous theme party without spending weeks laboring over every detail!